Lakefront Henning Cabin w/ Fantastic Lake Views! 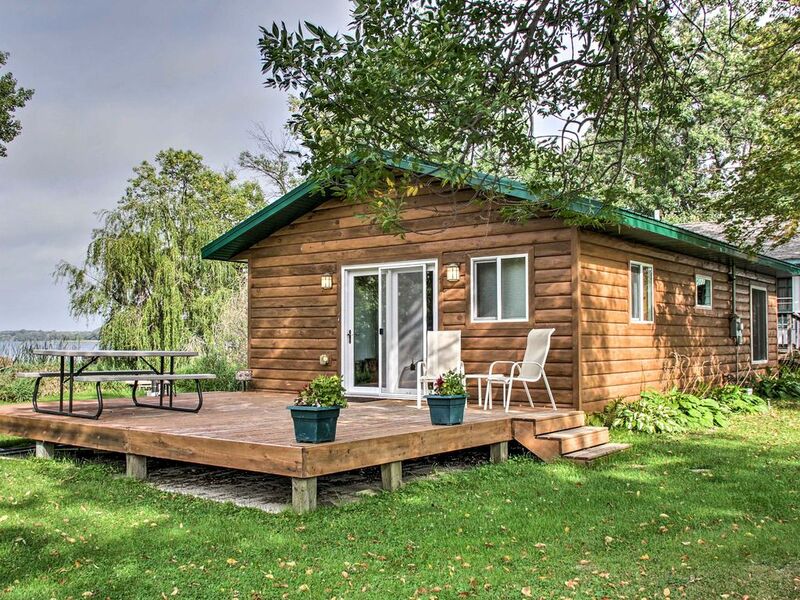 The quintessential Minnesota lakeside getaway awaits you at this delightful 2-bedroom, 1-bathroom Henning vacation rental cabin, which sleeps 4. Nestled on a beautiful sandy beach, bordered by a creek running through the premises, this serene lakefront dwelling offers a private deck with fantastic lake views, sensational sunsets, and easy access to the region’s abundant outdoor recreational activities! This lovely cabin is an ideal lodging choice for families, friends or couples out for a relaxing retreat on the lake. An extra 5th guest can fit as well with the addition of a blow-up mattress. The home was completely rebuilt in 2005 and features an inviting knotty pine interior and hickory floors, giving the space a wonderful, rustically charming atmosphere. All the amenities you need to feel as relaxed as possible during your stay are here, including an in-unit washer and dryer, ironing equipment, and a TV in the living room with DVD player. Prepare delicious home-cooked meals in the fully equipped kitchen, or whip up some barbecue on the gas grill. The cabin’s spacious deck is equipped with picnic furniture for outdoor dining. When you’re ready to have fun on the lake, you certainly won’t have to venture far! The cabin sits between the shores of East Leaf and West Leaf Lakes, with a stunning sand beach and dock on West Leaf Lake. The lake features a great lake bottom without a drop-off. A babbling creek runs through the property and borders the sandy beach, further adding to this tranquil atmosphere. If you’re traveling with kids, they’ll particularly love the large grassy lawn surrounding the cabin with ample room to run and play! You’ll get to enjoy easy access to a variety of exciting outdoor recreational opportunities. Popular activities in the area include fishing, boating, swimming, golfing, hiking and biking, all of which can be found within close proximity of the cabin. Regardless of how you choose to spend your time during your visit, this exceptional lakefront Henning vacation rental cabin will not disappoint! - Enjoy breathtaking lake views and spectacular sunsets over the water! - Outstanding lakefront location on West Leaf Lake with a beautiful private sandy beach and dock on the premises! My boyfriend and I stayed at this cute cabin the week leading up to Labor Day. We brought our fishing boat, so having the dock literally steps away was great. The pictures do not do it justice, believe me. My boyfriend kept saying he wondered if the owners would be interested in selling because he wanted to buy it and live there full time! :) The dock is literally within a few feet from the front door. We could see our boat, and the lake, from the front living room window. What an amazing view every day! The area off the dock is nice and sandy. It's very shallow, but not so much that we had issues with docking the boat. Very nice for swimming. The public boat launch could be seen from the cabin's dock, so nice and close. We stayed Sun-Thurs and felt like we were the only people in the area....it was so quiet. A little loon couple followed us each day when we went out fishing. It was so peaceful just sitting in the boat listening to their calls. We had an issue with the tv when we first arrived, but the owners were very responsive and resolved the issue. The cabin was adequately stocked with everything we needed. Even some stuff I would not have expected, like basic spices and even a crock pot (which we used to make a pot roast). We explored the area a bit due to some rainy weather and found a little supper club called Ottertail Lodge just a few miles away. Perham is also a short drive away. We recommend going there if you need to load up on groceries and they have a nice brew pub downtown and some very cute shops to explore. We are definitely going back next year. .
We had a fantastic time here. The cabin was comfortable, clean, attractively decorated, and stocked with many amenities. The lake itself is spectacular. This is a beautiful little cabin. All knotty pine on the inside too. Smells wonderful when you walk in. Has everything you need except good air conditioning. The air cooler unit with the tubing in the kitchen window is very cumbersome in the small kitchen and it doesn't cool well. Very thankful they had many fans!! It was 90 and very humid when we stayed. Beautiful lake too. I would come again in spring or fall when not so hot. The walking bridge over the creek needs repairs so walk slow. Thank you John and Amy! My husband really enjoyed the fishing. We both enjoyed the view and the small town vibe. Perfect cabin vacation. Perfect cabin vacation. Beautiful lake and cabin. We had a great time, cabin was very nice. Nice sandy beach. Fishing was great!